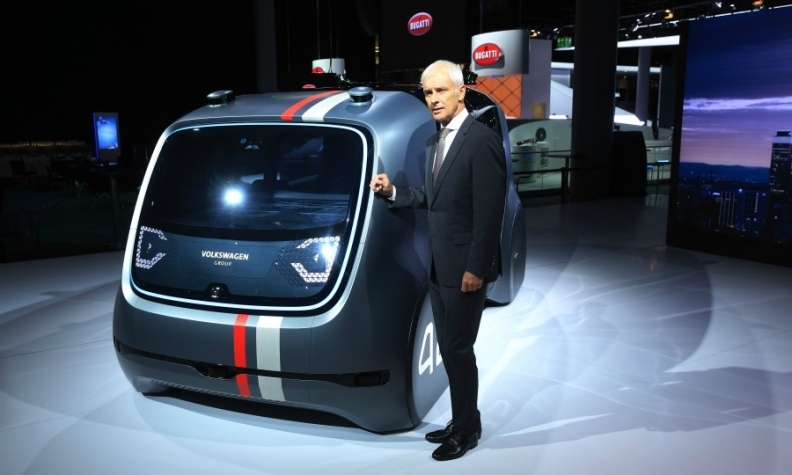 Mueller is pictured beside a VW Sedric electric autonomous vehicle concept at the Frankfurt auto show this month. WOLFSBURG -- Volkswagen Group has moved to distance itself from its reputation as a secretive and autocratic company by introducing a "Meeting Mueller" program which allows employees to put questions directly to the CEO. At the first meeting a few months ago, Mueller fielded questions from 10 employees who had been selected by lottery. About 300 employees took part in the second meeting shortly before the Frankfurt auto show. The format is designed to focus on explicitly confidential and hotly debated issues. The openness is important to Mueller. In his position, he is well aware that people do not always tell him the truth, according to the program. VW said Mueller "is dependent on employees' opinions and comments." In return, he shares knowledge that is crucial for managing the company. During an exchange with employees, Mueller indicated that the company is working on a new division of board responsibilities. Asked whether VW needs board-level supervision for information technology, he said: "Yes, but only in the right configuration." Regarding the regulated sale of data from customer profiles, Mueller told employees: "Our competitors will show us that you can earn money doing that." And consultants may have to steel themselves for tougher times at VW. In one meeting, Mueller was asked whether the company employs too many consultants. His answer: "Yes, we need to bring know-how inside again." Not surprisingly, on the subject of VW's strengths in EV production and its timetable for electric mobility, Mueller was upbeat. The company already has more plug-in hybrids and EVs in its lineup than "a number of self-declared electric pioneers," he emphasized in the internal discussions. At the Frankfurt auto show, Mueller announced a broad electrification offensive, the "Roadmap E," which will introduce 80 electric models by 2025 and invest $24 billion in greener technology by 2030. "In just a few years, we will be the company that shows everyone how to bring the future into series production," Mueller said. "When Volkswagen comes, it comes on strong. The competition, incidentally, knows this," he said. VW plans to organize the event with Mueller four times a year and it is expected to roll it out to include other board members in the future.